!!! 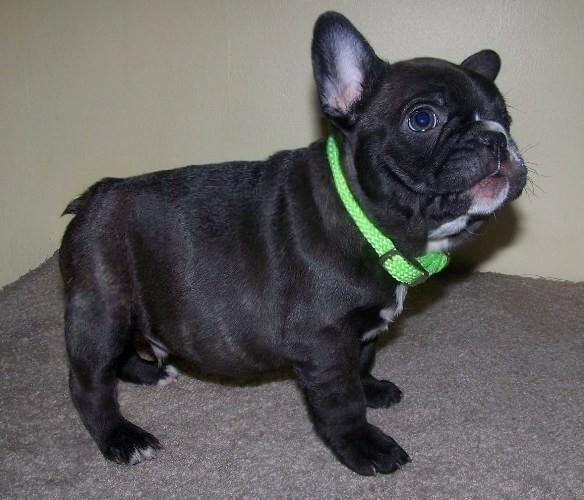 AKC REGISTERED FRENCH BULLDOGS FOR SALE - BORN & RAISED IN THE USA - NO IMPORTS !!! "ALL BABIES HAVE BEEN ADOPTED and place in their new homes!!! 4/28/2011: The babies are now 4 weeks old and completely weaned off the bottle as of yesterday. They are munching on their "puppy gruel" and loving every bite. These fatties do not have a problem eating... They are playing with eachother now, discovering what toys are about and personalities are just starting to form.. all sweet, all outgoing and all love attention. They still want their mommy (me), but they are now turning into little puppies, doing little puppy things. Such a cute stage for these adorabull bullies. 5/2/2011: The babies are 5 weeks old today and just doing absolutely fantastic... getting cuter every day. They play more each day and they eat like little piggies. They are way beyond sweet, cuddly and friendly...as expected. They love to be loved on and soon will be let out their little pool for their romps around the house... lots of exploring ahead for these babies :) They were de-wormed today again. Stay tuned for a new video at 5 weeks old. 5/10/2011: The babies are 6 weeks old now. They have graduated to their playpen area and out of their kiddie pool. They have daily romps in the family room and are still the little food hogs they were from the start... Getting cuter every day, such sweet babies. New photos posted and video coming soon. 5/16/2011: The babies are 7 weeks old now and what else is there to say... they are awesome. 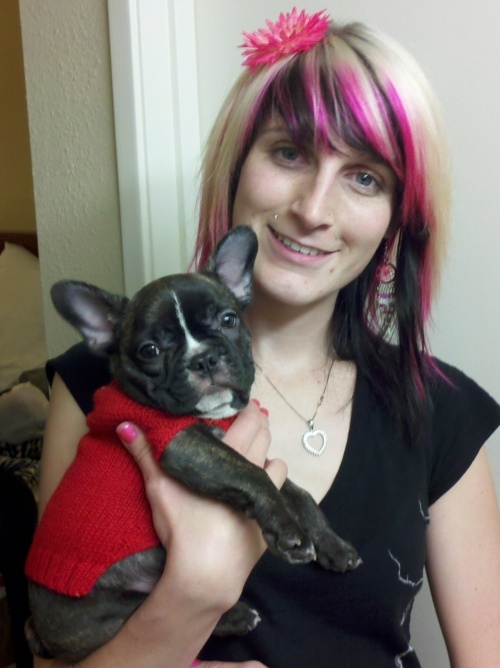 Great personalities, playful, outgoing, sweet, funny, everything frenchie babies should be. They continue to be little piglets devouring their food in less than 2 minutes lol. New videos are up, see our You Tube Channel. 5/18/2011: Posted new photos of Yogi and Milo with their ears up ... See their individual sections below. Each Puppy has their own section.... Photos shown from most recent to oldest.... Keep scrolling down, under individual sections are the photos of the whole litter starting since birth and photos of the parents, etc. Holding his ears up... how handsome is he... looks so different! *** Tigger *** now called "Gary"
*** Mickey *** now called "Terrence"
Although we lost her... I wanted to add her Newborn Logo here in her honor! Momma in the car nursing babies. Because the Vet is 2½ hours from the house we stop to let the babies nurse on the way home... Mommy was tired after her surgery, to be expected. Most websoite out there will not show you mother and puppies together, they won't show you mom with puppies because momma is in baf confition or not healthy looking... we don't hide our momma's, I am proud of the car I put into them while pregnant... and I show my girls pregnant and nursing their babies.